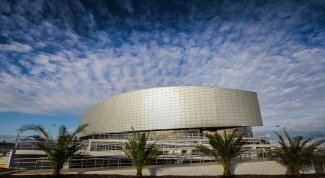 The Ice Cube Curling Center (Керлинговый Центр Ледяной куб) is a 3,000-seat multi-purpose arena in Sochi, Russia, that opened in 2012. It hosted all the curling competitions at the 2014 Olympic Winter Games and the wheelchair curling competition at the 2014 Paralympic Winter Games. It cost approximately $14 million USD to build the venue, including the temporary works for the Olympics and Paralympics, and opened in 2012 in time for the World Junior Curling Championships and World Wheelchair Curling Championship in 2013. After the 2014 games, it has remained a sports arena although the venue is portable and may be re-located if desired.